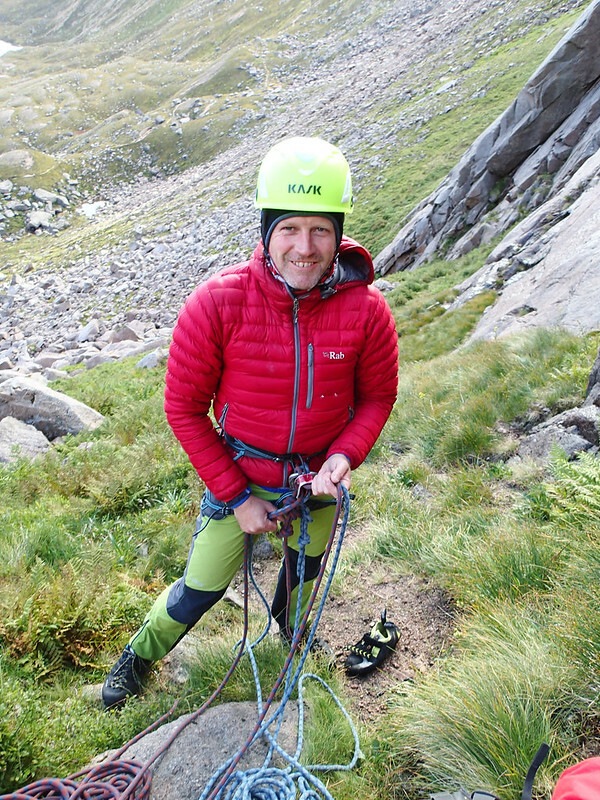 As reported widely (see, for example, the UKC report), two great climbers recently lost their lives in Ben Hope, Northern Highlands during climbing. They were Andy Nisbet and Steve Perry — both happen to be my good friends, to my greatest horror and sorrow. I do not get into the detail of the circumstances of the accident, but just comment it seems either an unfortunate slip or slide of snow/ice underfoot, despite their great deal (or objectively almost unrivalled in Andy’s case) of experience in winter mountains, resulted in the fatal consequence. The accident is another stark reminder no one is invincible and we climbers must be really diligent of our actions, every action in mountains. Most shocking the news be, it should never be a stopper of what we love and they loved. I too will go climbing, not to repeat such an incident obviously, but to remember them and to celebrate their legacy. Here I am writing about what my dear friends Andy and Steve were from my personal perspective. Their being may have perished, but their legacy will live for ever in me, their families, present and future climbers, and wider field. I came to have a privilege to get to know Andy and become a friend in late 2013, after he had hit 60 years old mark earlier in the year. Gary Latter wrote a great article about him “60 years of Andy Nisbet” in that occasion. In the winter season, Andy established over 60 new winter routes in Scotland [Edit (2019-02-12): 74, more precisely, according to Andy himself (Source: Andy's interview in a film)], celebrating his age, and (I believe) broke the total number of his new routes in Scotland of 1000 — utterly unprecedented feat. I too had an opportunity in the season to share the experience with him to add a new route in the remotest crag in Loch Avon Basin, Stacan Dubha: Slogra 150m V,4. Here are some facts to understand the extent of his incredible achievement. Scottish winter routes are mostly multi-pitch, involving a long walk-in and out (it took almost 3 hours for us to get to Stacan Dubha, for example). The daytime is so short (5 hours on the winter solstice). Hence it is unusual to do more than one winter route in a day for a team of climbers. And, half the time during the winter season, you are shut down due to weather, either too warm (you would not climb ice when ice is melting) or too windy (simply deadly). For that reason, most of keen winter climbers based in England don’t or can’t climb more than 10 winter routes in Scotland (let alone new routes) in a season. Say, if they plan one dedicated week and 5 weekends (two of which would be cancelled due to weather) in Scotland, they will just scrape 10 routes in a season. And a majority of them climb no new route in their lifetime. To climb (over!) 60 winter routes in a season, you virtually have to get out every day when the weather allows during a season. In Andy’s case every time he got out, he tried to find a new line and managed to climb it most of the time. You have to remember that whereas to climb an established route is hard enough, to climb a new route can be much harder, as there is no prior knowledge about it. It is not unusual one has to back off in the middle or even near the top of the attempted new route, finding it too hard or risky. 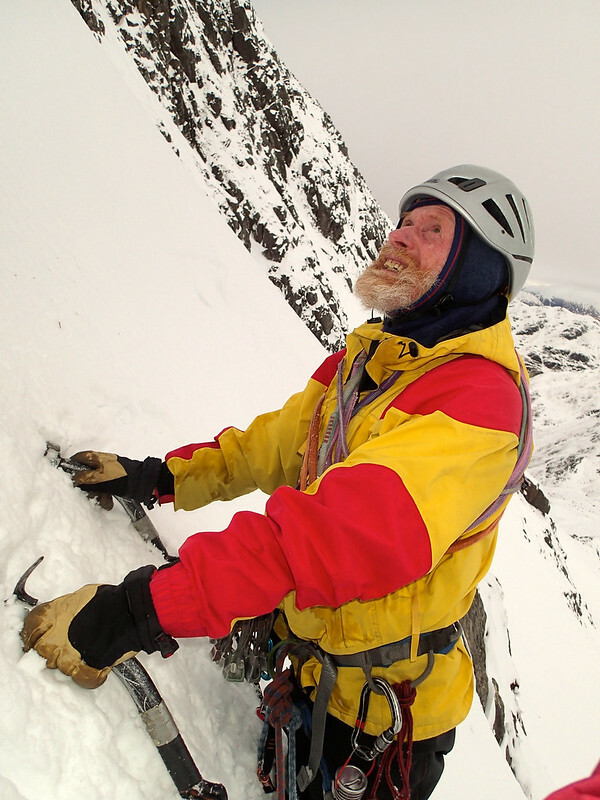 Establishing 60 new winter routes in a lifetime would a great achievement for any climbers, let alone in a season, let alone for a guy at the age of 60. Gob-smacking. Andy’s knowledge about Scottish winter climbing, especially in the face of changeable weather, is literally unrivalled by anyone. He is the Scottish winter climbing. Every time the conditions are in suspect in winter, I rang Andy for his expert advice. Last time I rang him was mere 10 days before his fatal accident… He was always willing to help me as best he could, giving away all his knowledge, in his usual humble way in his soothing soft voice: Maybe ……, though I’m not sure. Only the exception is when it is related to one of the new crags he is secretly developing; it rarely happens, though, because they tend to be in an esoteric place and you have no idea about them in the first place. 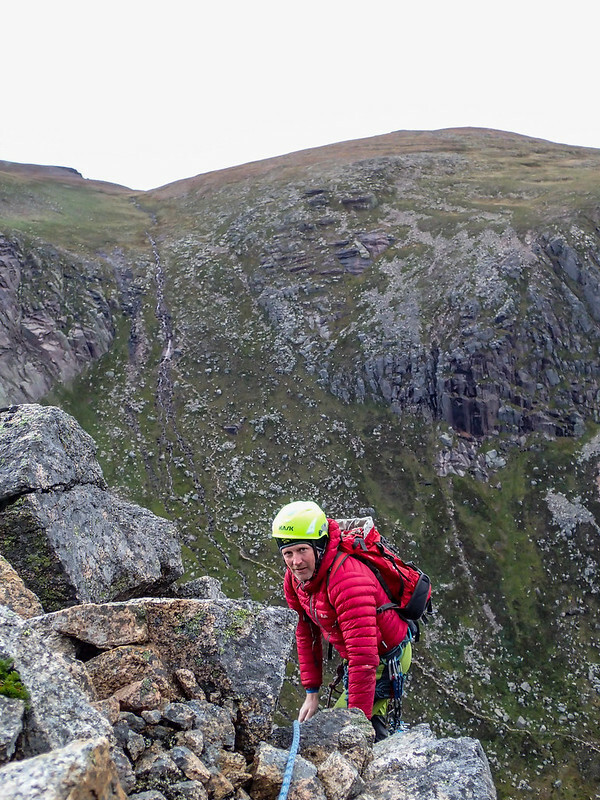 On one of the days during the meet, Andy lead a team and headed to Coire an Lochain in Cairngorms, hoping some routes might be in (safely and ethically climbable) condition. None of the routes was, as we found out once we got close to the corrie. Andy then lead the group to go to the next corrie (Coire an t-Sneachda) and managed to find a climbable route (Fiacaille Couloir). 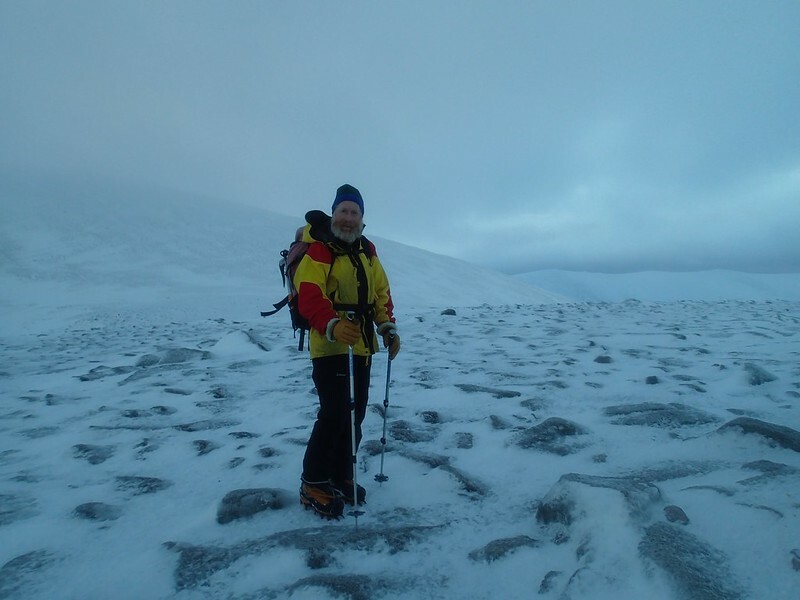 He had guessed, considering the past weather history including the direction of the wind and snowfall and what he had seen in Coire an Lochain on the day, there would be a chance for ice to have survived on the route, and he was right. His team (including Kyle Wood (UK), Steve Towne (USA), Vedran Salopek (Croatia), if my memory serves me right) were the only climbers among 60 of us that managed to do a winter route on the day. Andy Nisbet leading a group to the next corrie, where they did find a doable route in this poor condition on a day during the BMC International Scottish Winter Meet 2016. A typical (though not as bad as the day on the left panel) condition during the BMC Meet 2016. Andy Nisbet looking up at the bottom of the crux P2 of the new route Cailleach, Beinn Fhada. Andy has a PhD (in biochemistry), and has once worked in the professional field in his youth. However, he decided it would not be his career, ditched the safe job, and instead chose to spend his entire life in mountains, as a climbing instructor, guide, and individual climber. That was a bold move, and probably was even more so back then than now, when the job and social security was not as good as modern days. For modern Scottish climbers (and oldies, too), to plan a multi-day ascent of a route is almost unthinkable. I have heard of stories and have experienced by myself in multiple occasions that climbing in winter Scotland taking so long, we got back late or even in the early hours of the following day. But they are kind of, though not entirely unforeseeable but prepared, accident. By contrast, to climb a hard route with an extra set of heavy gear for bivvying in guaranteed cold and miserable conditions is an entirely different story. However, if one is so keen to climb a long route at their limit, then to be prepared for bivvy is indeed a logical way forward to overcome it. Apparently Andy’s logical thinking lead him to the strategy. He planned it and did it in multiple occasions, admirably. 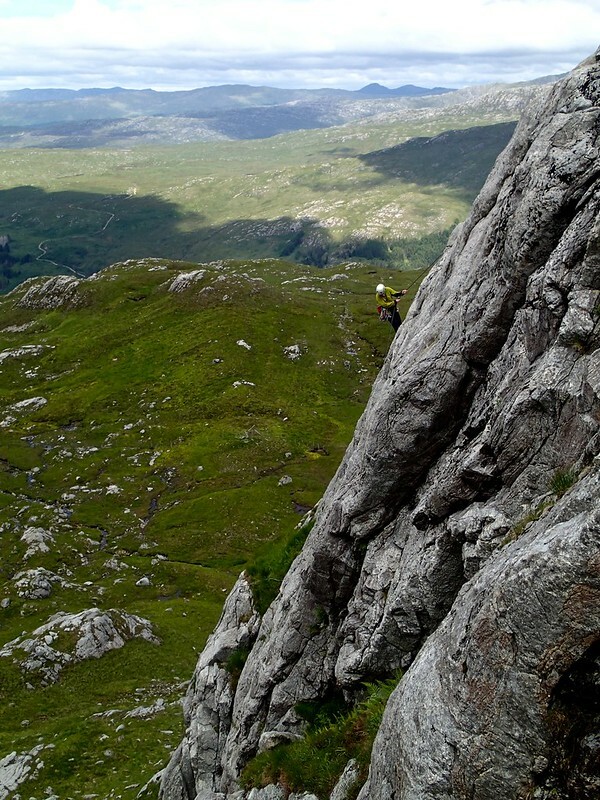 Andy Nisbet on Yin and Young, Creach Bheinn. The most likely second ascent, as a part of checking up the existing routes as a guidebook editor. Another field Andy excels is the (unofficial and voluntary) job of a librarian dedicated to Scottish climbing. The definitive source of information about the climbing routes in Scotland is administered by The Scottish Mountaineering Club, and Andy is the main guy for the job. Every time some one said in SNS or wherever they had climbed a new route, they, be it a superstar or an unknown climber, would be asked to give the detail by Andy almost immediately (for example, see the posts of tribute on Facebook by Dave MacLeod and Greg McInnes (Boswell)). 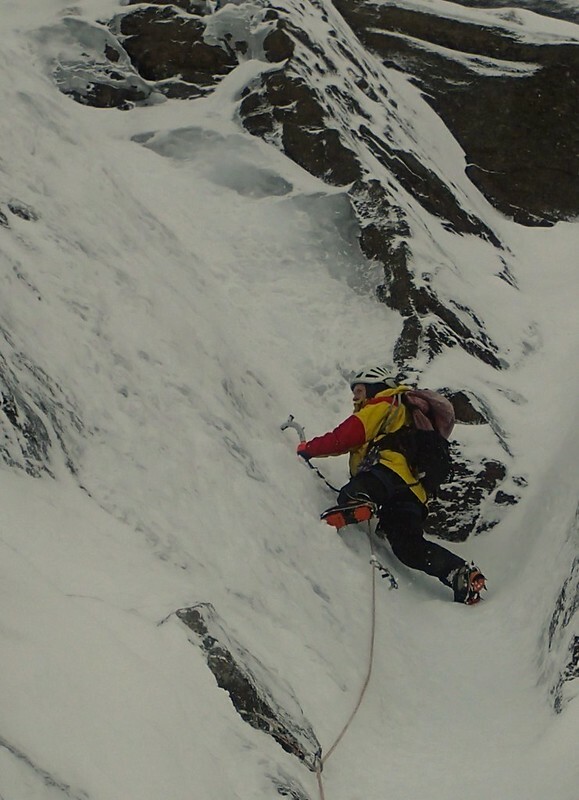 Andy has compiled the major revision of the SMC Scottish Winter Climbs in 2008, and has been working on the major revision of Rock Climbs in the last couple of years. 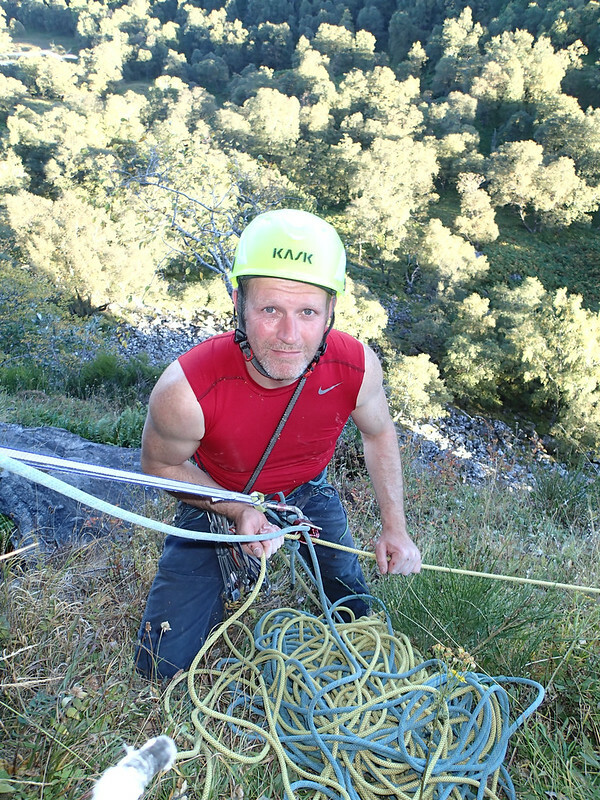 In between, he worked hard on Highland Outcrops South, which is the definitive guide of trad climbing routes on outcrops (that is, those in major mountains such as Ben Nevis are excluded) in Southern Highlands. Here is an example of a few days in a week I spent with Andy. 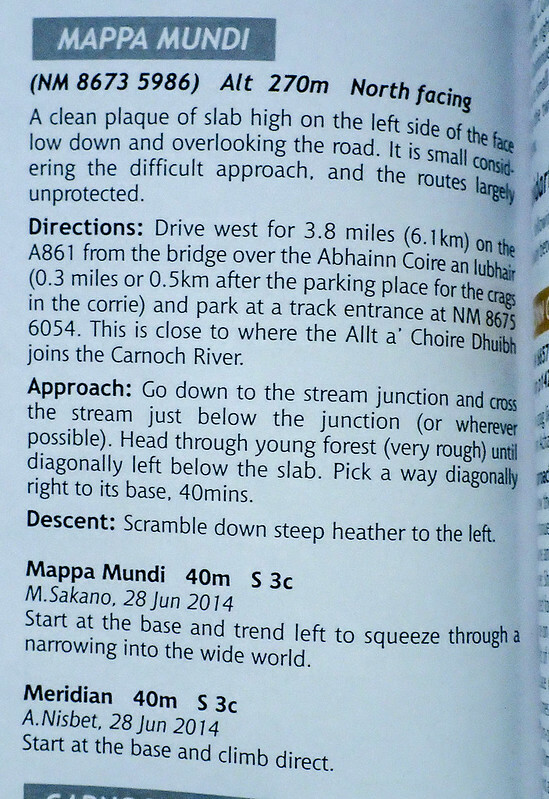 Description of the wee crag Mappa Mundi in Ardgour in the SMC guidebook Highland Outcrops South , authored by Andy Nisbet. On 2014 June 28th, Andy and I drove to Ardgour, a region west of Fort William beyond Loch Linnhe, taking Corran Ferry to cross the loch. 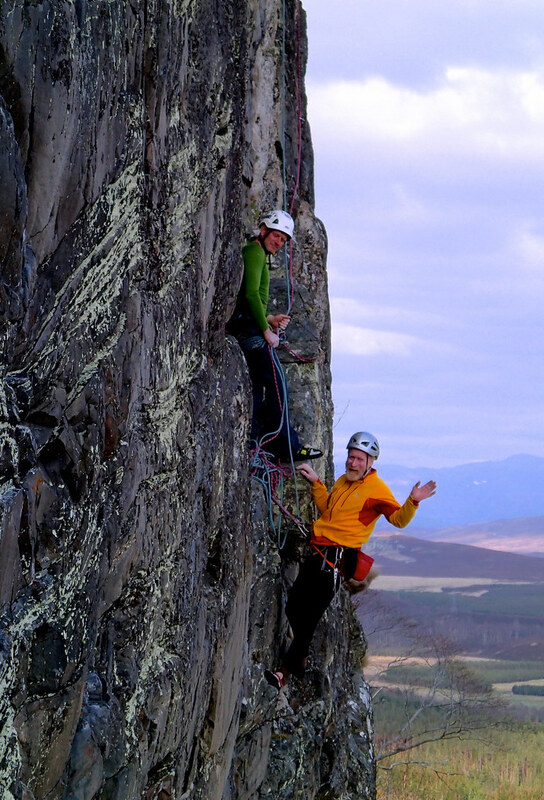 The aim was to check out the new crag called An Coire Dubh in the mountain Craech Bheinn. The crag was found by some locals recently and a few routes have been reported to Andy. They should be included in the forthcoming Highland Outcrops South guidebook. As the guidebook editor, Andy felt obliged to ensure the accuracy of its description. As soon as we parked at a lay-by, Andy was busy taking a memo of the GPS coordinates, which then happened many times during the day at the cliff bottoms, etc. We checked out the parking, approach, and then reported routes by actually climbing some of them, Andy checking out the consistency of the description given to him. Then, we climbed a couple of our own new routes (of course, that was the fun part for Andy!). It is small considering the difficult approach, and the routes largely unprotected. Andy must have felt compelled to check out the new crag, or any potential new crags, while he was in the area. I should add the approach to none of them is easy going, often involving bush-whacking and/or bog-crossing, as there is no path. Two days later, we went to another remote (but established) crag, Creag Mhòr Bhrinicoire, again mainly to check out the crag conditions for the guidebook. Andy Nisbet checking out (existing) routes and crag status in the remote crag Creag Mhòr Bhrinicoire, Highland. 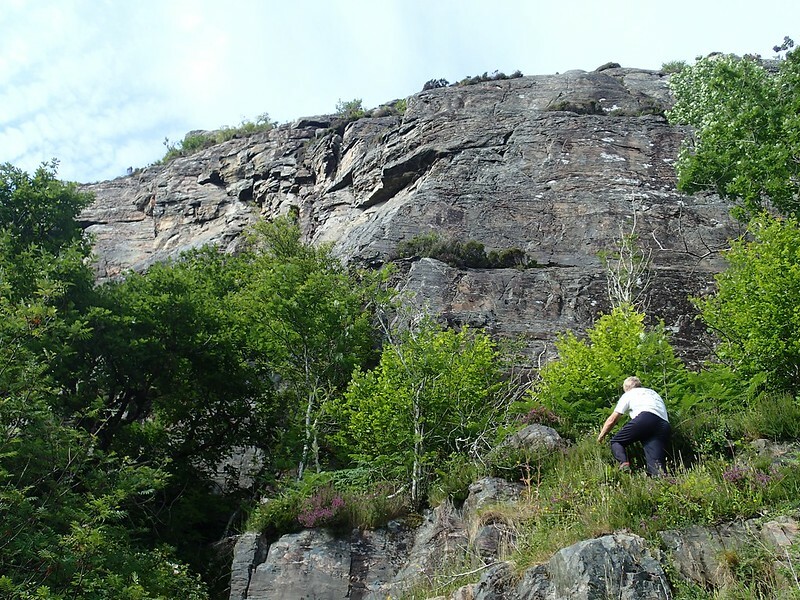 Andy's effort to check out a crag (near Creag Mhòr Bhrinicoire). Andy Nisbet abseiling off in Creach Bheinn. Then Andy suggested to go back to An Coire Dubh in Ardgour the following day to climb new routes, especially the fancy-looking corner he had spotted in our previous visit 3 days ago. So did we, braving the dodgy weather. The left-rising crack has been followed to join Microlight (E2 5c overall), but not in good enough style to claim as ascent. The description appears on that of the neighbouring route, which shares the same start and was first climbed 2 months later by a team, including the locals and Andy himself. In other words, he was honest not to claim the first ascent, and also went back there to straighten the route. On the day we left the crag in rain. 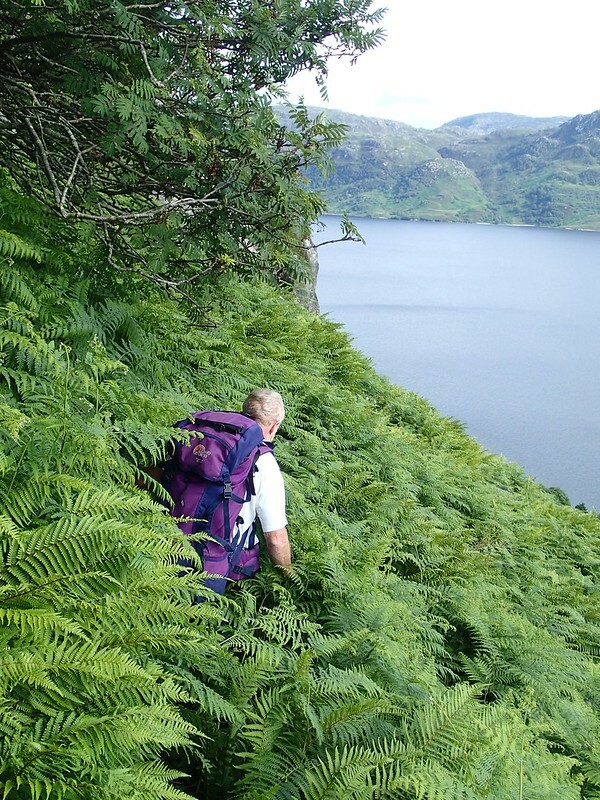 But before taking a ferry, Andy stopped at another lay-by in the glen, and we walked up a subsidiary glen to another local crag (Snake Crag), just to check it out for the guidebook (recording the coordinates etc). The sheer enthusiasm and drive of Andy as a climber and guidebook editor is astonishing. I should add he hardly gets any return for his guidebook work, maybe not much more than a few free copies of the guidebook. The reward certainly does not cover at all even fuel for travelling, let alone his time. Love is the only motivation of his I can describe. I have talked to Andy about routes and guidebook descriptions in many occasions, often giving him a feedback of what I found (in the routes I had climbed). I know how careful he put the wording in the very limited space in guidebooks. The slightest nuance of wording can change the impression significantly, as I realised after hearing his explanation. It is a common sight for climbers to complain how vague and inaccurate the guidebook descriptions are. Knowing Andy and his tremendous efforts, passion and meticulous attitude, I swear the descriptions in his edited guidebooks are as good as humanly possible. Andy Nisbet was not only the most prolific Scottish winter climber but also the greatest and most meticulous (summer and winter) climbing guidebook editor of all time. How Andy's research turns into the guidebook topo (Snake Crag, Ardgour, Highland; topo taken from the SMC "Highland Outcrops South" (2016), authored by Andy Nisbet). Last but not least, every one who has ever chatted with Andy knows how gentle he is, perhaps against his initial impression of a heavily-bearded tough guy. He has a strong will and character (of course! Otherwise, how could he possibly achieve what he has done? ), but he keeps it in just himself, so to speak. To any of his friends to my best knowledge, he was a true gentleman, spoke always logic and sense, and was so warm-hearted. 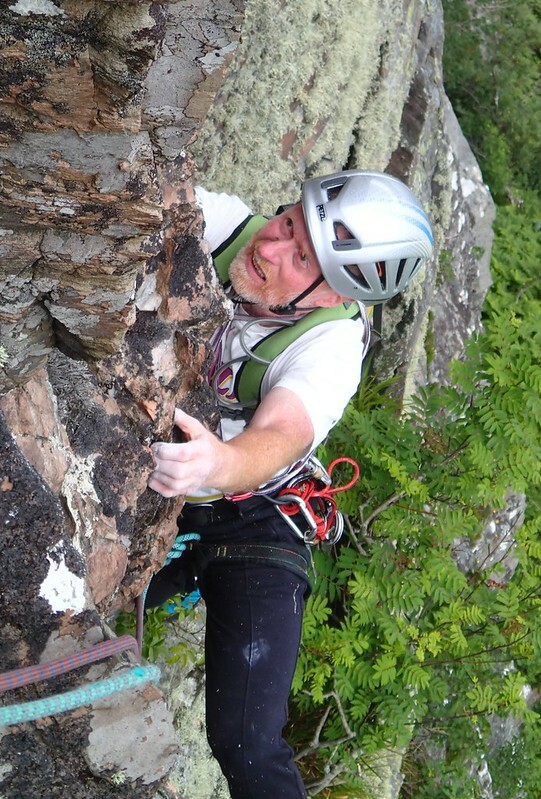 He retired from his guiding work at the age of 60 or so, just to free up his time to do what he loves the most, climbing. I am afraid his retired life has never been financially good, as one of his friends described it as miserable. But he seemed happy and content with what he has, namely time and freedom and just enough money to live on. Andy is the most dedicated unsponsored climber I know, despite his age of mid-60s. After the incident, I heard Steve’s funeral might take place in England. The first person I thought of to share a lift to go there was Andy, and I immediately realised the flaw of the idea. 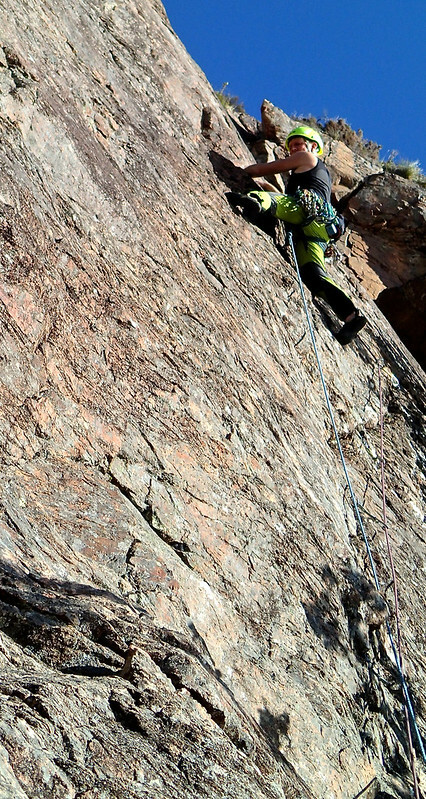 Andy Nisbet on a new route in Stag Rocks, Cairngorms, Highland. 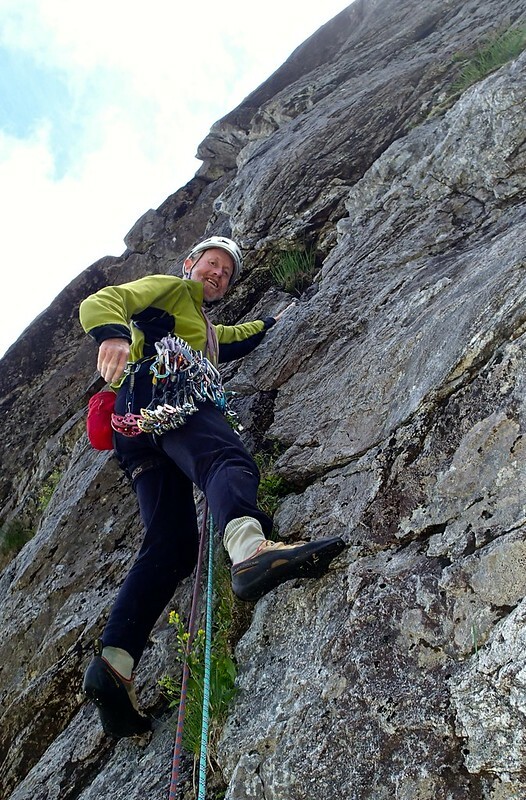 Andy Nisbet on Grand Old Master, Creag Mhòr Bhrinicoire. 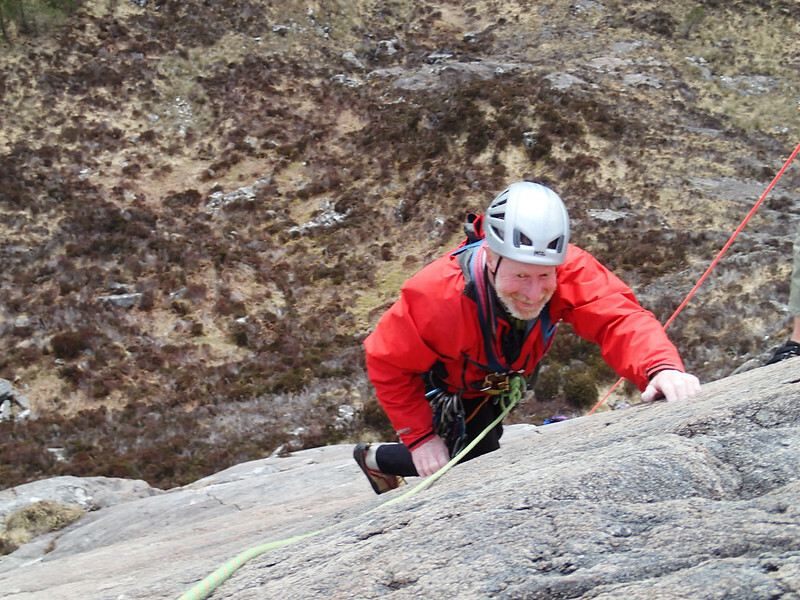 Andy Nisbet on Bald Eagle, Stone Valley Crags, Gairloch, Highland. 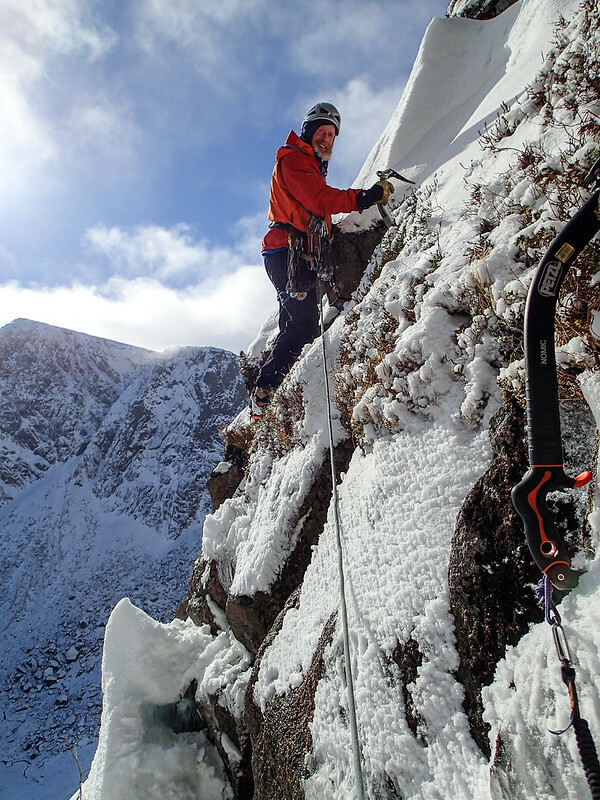 Andy Nisbet at Peak 1141 in Cairngorms. First, let me recommend to have a read of Simon Richardson’s great tribute to him “Steve Perry (1971 – 2019)”. Having done some winter walking in Scottish Munros, I assure you it is not an easy feat by any means. Indeed, most walkers are happy if they tick a Munro in a summer weekend with use of a car as much as possible. Ticking all the Munros is the life-long goal for many walkers. The winter round, as opposed to summer, is in a different league. To give an idea, here is my wee experience. On a winter day, I went out to summit a few Munros in a day along a continuous ridge [Ben Lawers area] by myself. The forecast was better than on either side of the day, but was still very poor and blizzard was expected. I thought at least I would not get lost along the fairly narrow ridge even in poor visibility. 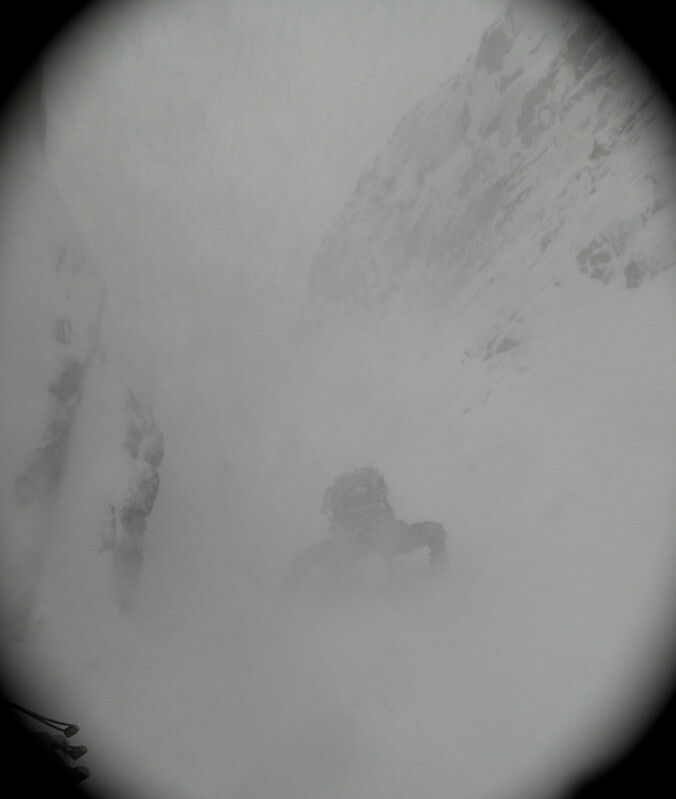 Then, once I reached the ridge in brutal blizzard with zero visibility, I realised I could not see the extent of the cornice on the ridge at all. I might step out without realising and walk on cornice developed over the air unsupported by the ground, which could easily be fatal. I had no choice but turned back, empty handed. Even in winter, you might tick multiple Munros, if you are fit and are at the right area, on a nice day, which is rare in Scotland. On any other days, you have to fight at best, and at worst it is almost impossible or too dangerous. You simply can’t do “rain or shine” in Scottish winter. No wonder, to my best knowledge, no one else has done Winter284 (n.b., the official number of the Munros is 283 at the time of writing), or even close. Note [2019-03-03]: I had a chance to talk to Lorraine Mccall, who had given Steve in his Winter284 a good support (allegedly her achievement of a continuous summer round of the Munros on foot and kayak in 2005 had inspired Steve to undertake Winter284, and Steve consulted Lorraine thoroughly about the logistics). The winter was not baltic cold in general, but was pretty snowy. Steve and she fought in waist-deep snow for a prolonged time in one occasion when she accompanied him for a day. Though she and other people accompanied Steve at times, Steve was mostly on his own; Steve didn't see any other souls for 13 consecutive days in one period, for example. A quote by Dan Bailey a Munro and a 28km march as more or less a rest day (TRAIL Volume 2006 March, after Dan accompanied Steve for a day during his Winter284) tells something about what the ordeal takes? Steve belaying one of his seconds at the top of the Most Girls Do, Creag Dubh. Steve is a really tough guy. He has got to be. I sometimes take off gloves and climb bear-handed. That’s alright. No gloves are obviously the ultimate thinness and dexterity, but…. Yet, he is one of the most pleasant guys to spend time and get along with. He is energetic, but not in an aggressive way, and is modest. In fact I didn’t know his grand records of walking until much later after I had got to know him, as he never talked, let alone boasted, about them, unless you ask him. His knowledge about Munros was of course immense, and he had no hesitation to share all his knowledge from logistics to conditions, if you asked him, though. Although his experience in climbing was limited, he having taken on climbing seriously in his 40s, his enthusiasm was almost unrivalled, pehaps only matched by Andy Nisbet. No wonder he was a good match with Andy, combined with his natural toughness, hard-gained fitness, and nice character, and they have established a strong partnership in recent years. Steve and I have shared many hours in climbing, mostly on rock and sometimes in indoor walls (but not in winter for no reason). One iconic time was September 2015. 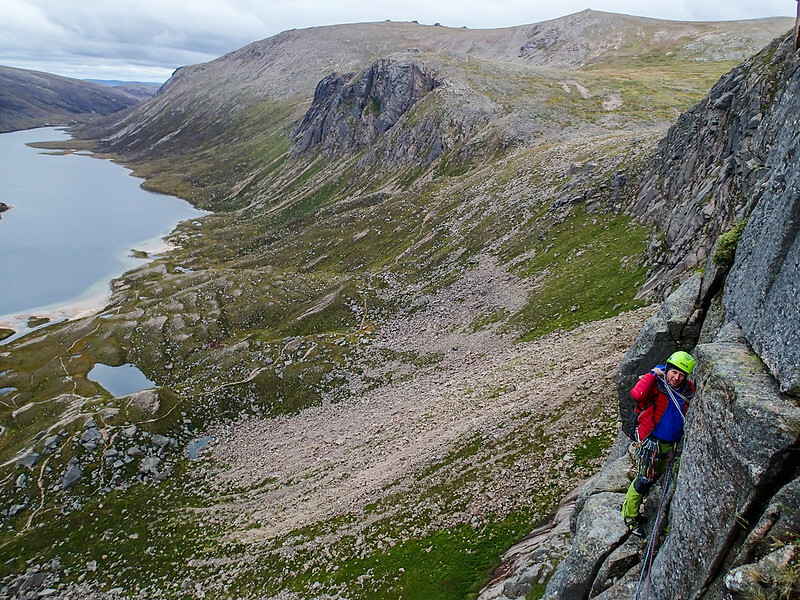 We ventured out to Shelter Stone Crag in Loch Avon Basin, Cairngorms, and climbed the uber-classic route, The Needle. I can’t forget Steve’s beaming face after the climb, claiming it was the best rock route he had ever climbed! He struggled a bit in leading the crux P2, but that just added up to his memory. I may have to retract my word. This is the best route I’ve ever done. Brilliant! In both the times, no one else was around in the crag, or even within our sight in Shelter Stone. Just two of us share our happiest time between us. Steve Perry topping out The Needle, Shelter Stone Crag, Cairngorms, Highland. Steve Perry on The Pillar, Diabaig, Torridon, Highland. Steve Perry at the start of The Needle, Shelter Stone Crag, Cairngorms, Highland. Steve and I have made a promise to go and climb a trad rock route called Angel Face in Beinn Eighe, Torridon. It is Andy Nisbet’s masterpiece established in 1988, and one of the best-quality routes at the grade in the country. For our regular climbing partner Andy, to climb it (again) is unlikely to be of interest, and hence that is the plan between Steve and myself. It would be really nice to climb a legendary route of our common legendary friend. Steve Perry coming up on P5 of The Needle in the background of beautiful Loch Avon Basin. 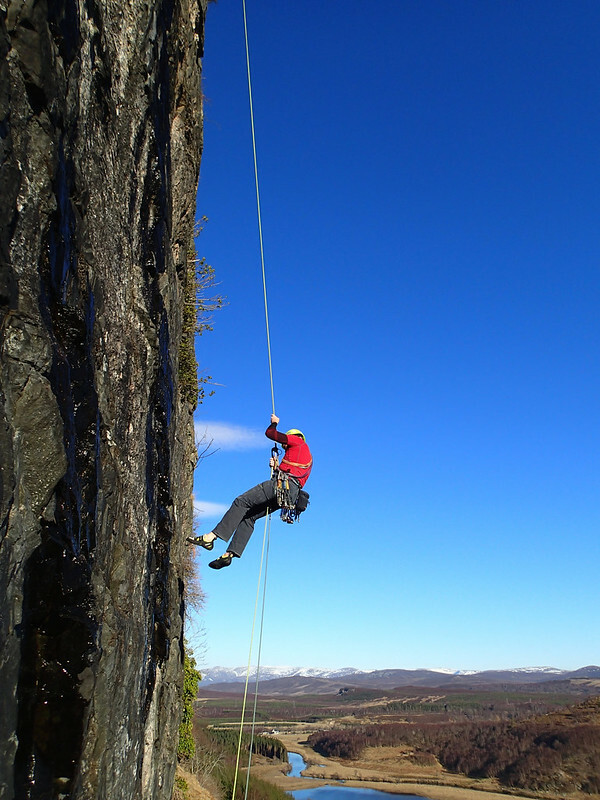 Steve Perry abseiling in Creag Dubh, Highland. It is my greatest sadness to say good-bye to my two very respectable good friends, Andy Nisbet and Steve Perry. You have lived the life fullest, and your legacy will live for ever. We will keep roaming mountains you have loved so much, pursuing the spirit of adventure as long as we live, and will pass it on to the next generations. 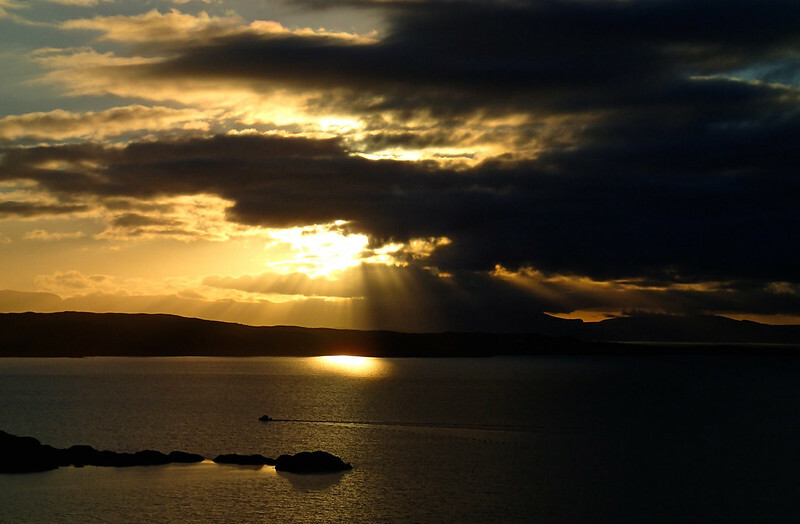 Beautiful sunset Steve and I enjoyed from a crag above the wee remote village Diabaig in the Highlands in autumn. The following references have been added after the main article was written. 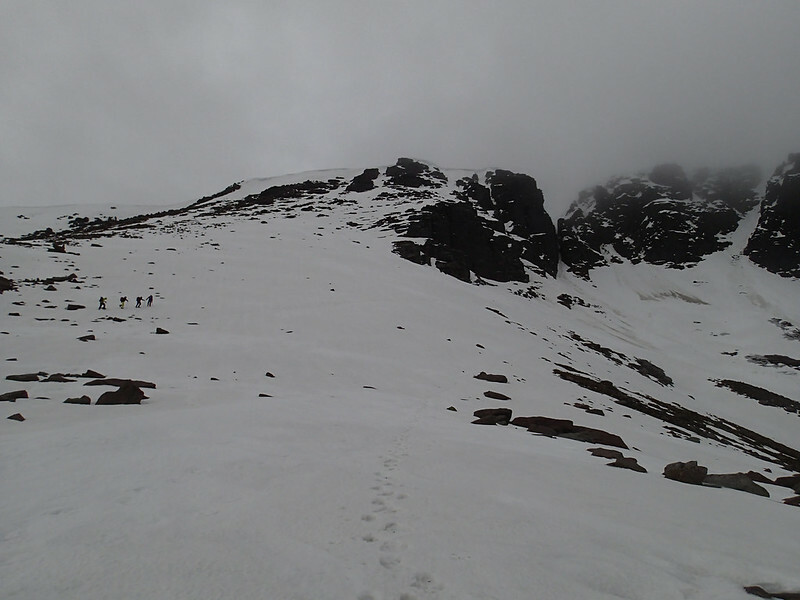 Video “Basteir Tooth - Survey”, 2013, organised by The Munro Society in conjunction with the Scottish Mountaineering Club and surveyed by G&J Surveys, where Andy Nisbet is taking part as the climbing leader. Note: All the photos belong to Masa Sakano, unless otherwise mentioned, under the license of CC-SA 2.0. Thank you. I remember something. The item left in the hut on that occasion may have been my boots as we excitedly drove off for a first visit to Supercrag. I definitely remember stepping in a few bogs and my trainers being rather the worse for wear when we got back. Steve wasn't climbing great at the time, and I was almost forced to lower him into the sea when he failed to second the diagonal Rolling Foam. Luckily for him, as he gradually spun on the rope and a full soaking seemed ever more likely, he just managed to land on a solitary boulder and leap back onto land. (I've only just remembered this!). In true Steve character, when I tried to apologise for poor choice of route he waved it aside and said it was his own fault for climbing badly. Last year he was just starting to get really good. A great guy. Thank you, Michael, for your comment and sharing your memory! Gary has reminded me "It was Steve that left a small shopping bag in the porch, containing a phone charger and a bar of chocolate." which he then dropped off in my place on his way back. That seemed right! 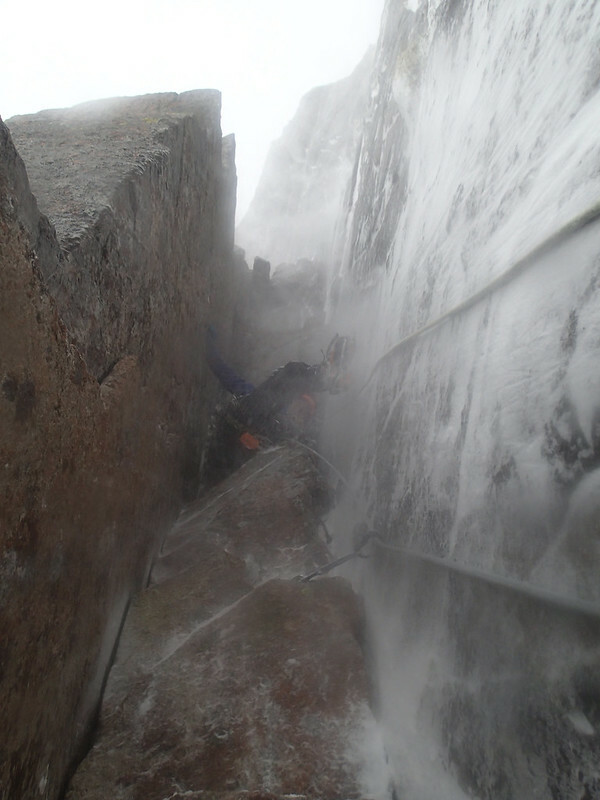 I envy your trip with Steve to Supercrag (but not near-miss of full soaking bit…). I can vividly imagine how he waved it aside. I hear Supercrag is fairly tricky to locate but is super, as the name implies. Maybe we can make a trip plan in the future in memory of Steve? Hi Masa, sent you an email.